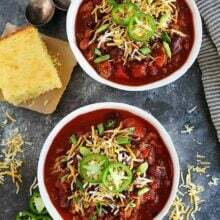 Smoky Bacon Chili-meat lovers will go crazy for this chili. It is made with sausage, beef, and BACON! It is a game day favorite! This is a sponsored post by Hunt’s® tomatoes. All opinions are my own. It’s less than a week away from the big game and that means it is crunch time. It is time to figure out what is on the menu! We all know the food is the most important part of the game:) I love football, but I love food even more. 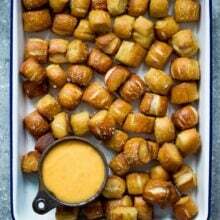 I have started a game day food list and it keeps getting longer. 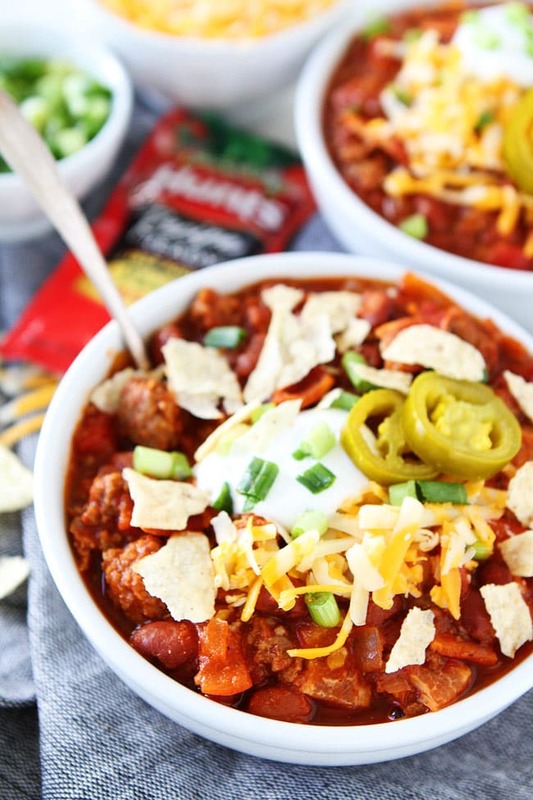 There are so many things to make…pretzel bites, nachos, chips and salsa, guacamole, pizza rolls, and this Smoky Bacon Chili. 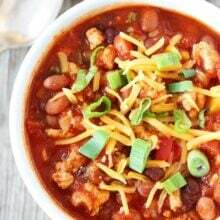 My boys say this is the ultimate game day chili and a MUST for the big game. 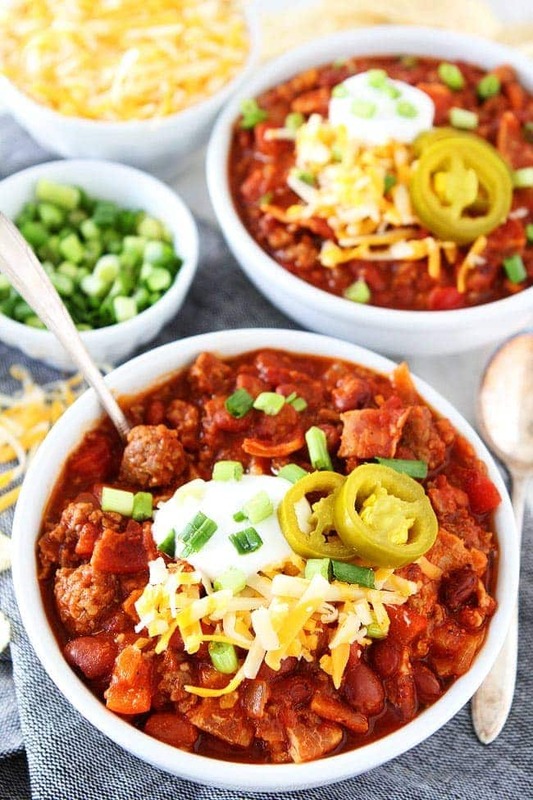 Meat lovers will go crazy for this chili because it is made with sausage, ground beef, and bacon. Bacon in chili? Yep! Josh says it is the secret ingredient that will keep you coming back for more. It adds a nice smokiness to the chili. The chili also has smoked paprika to bring out the smoky flavor. 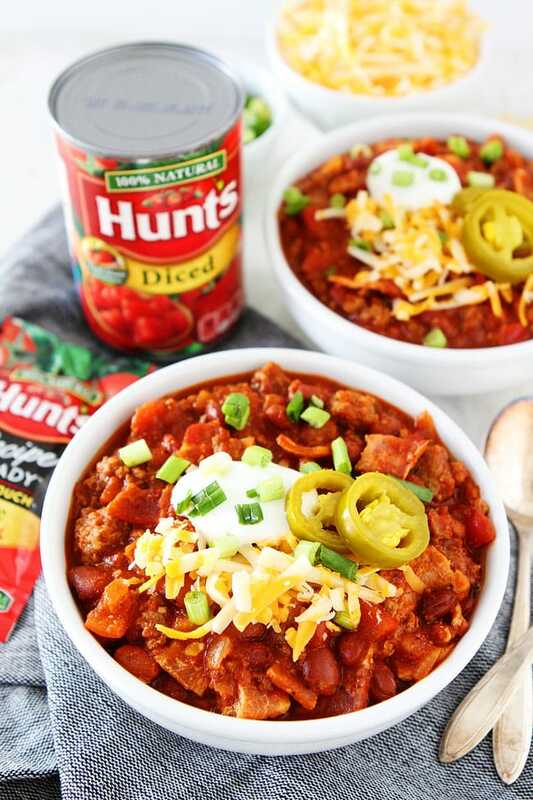 The chili is also made with onion, red bell pepper, garlic, Hunt’s Recipe Ready Tomato Paste, Hunt’s Tomato Sauce, Hunt’s Diced Tomatoes, beans, jalapeno, chili powder, cumin, and pure maple syrup. The maple syrup compliments the bacon and adds the perfect amount of sweetness to the chili. 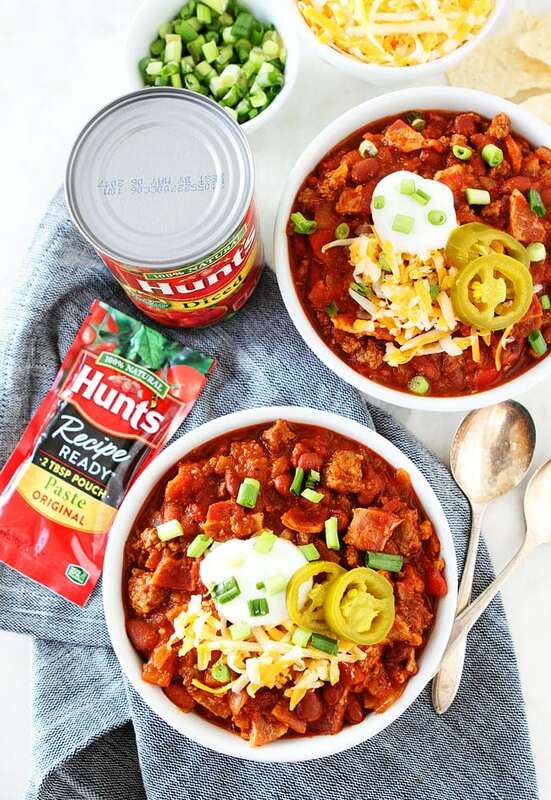 We like to use Hunt’s Recipe Ready Tomato Paste for this recipe because the pouches contain two tablespoons of tomato paste, the perfect amount for most recipes and this chili. The pouches are so easy to use too and super convenient. We always keep them in our pantry. When the chili is done simmering, it is time to load on the toppings! Top with shredded cheese, green onion, jalapeno slices, and sour cream. 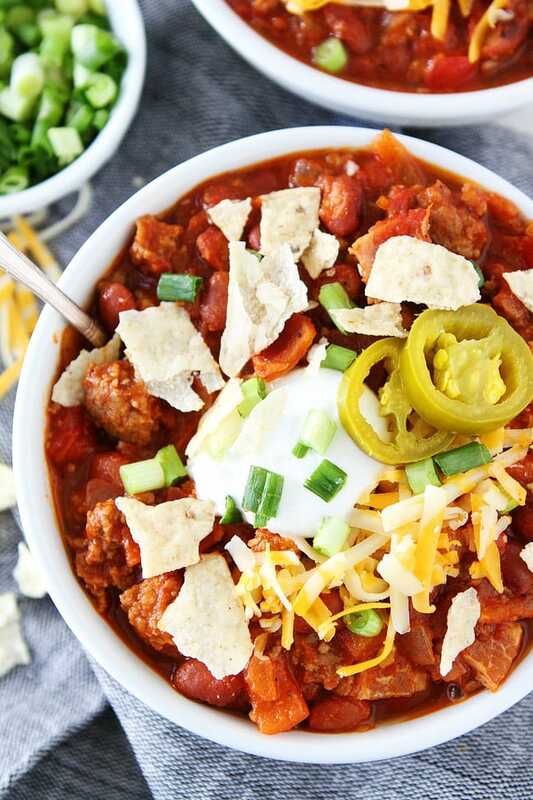 A loaded bowl of Smoky Bacon Chili is the perfect way to watch the game. 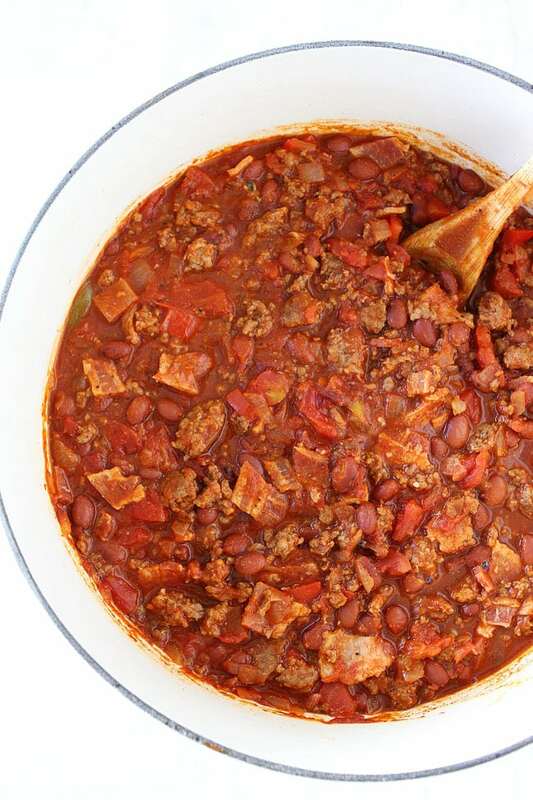 And if you can’t wait until game day, this chili makes a great meal any day. Enjoy! 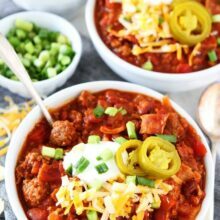 This is the ultimate chili recipe, it is made with sausage, beef, AND bacon! In a large pot, heat the olive oil over medium heat. Add the beef and sausage and cook until browned, about 8 to 10 minutes, stirring frequently. Remove the meat from the pan and place on a plate that has been lined with paper towels. Set aside. Add the onion, red pepper, and garlic to the pan and cook until softened, stirring occasionally, about 5 minutes. Add the tomato paste, tomato sauce, diced tomatoes, beans, bacon, and jalapeno slices. Stir until combined and add the cooked sausage and beef. Season with chili powder, cumin, smoked paprika, maple syrup, and salt and pepper, to taste. Stir and let the chili simmer on low for 30 minutes or until chili has thickened. Serve the chili warm with desired toppings. You can follow Hunt’s tomatoes on Facebook, Pinterest, and Twitter. We would probably omit the beans, but this has everything that my household loves. Bacon and sausage and chili are a perfect combo!! This is one hardy bowl of deliciousness! Bacon in chili? YES PLEASE!! I can’t believe I haven’t thought of it before!! My 7 year old would flip for this chili! looks so good Maria! I love the combo of beef, sausage, and bacon in this…I have never thought to put bacon in chili, but it sounds delicious. My boys love this chili! Would it be better the second day?? Thinking of making this for a chili cook off and wondering if I should make it the day before. Thanks! I think chili is always better the second day:) You can definitely make it the day before. Good luck in the cook off! This recipe sounds almost like what I make. I use Farmland pork sausage with bacon, my own tomato sauce, my own tomato’s a I put in some of my own salsa as well. I never thought of putting in any maple syrup, i might have to try that the next time I make some chili. Still SO happy it’s chili season! Always a crowd pleaser! I just came here for some inspiration and you didn’t let me down, I have to commend you on a beautifully photographed chili with a “why didn’t I think of that?” twist of bacon, now how about some kind of gourmet bacon….? This recipe looks so comforting for these long winter months! I made this for dinner tonight! 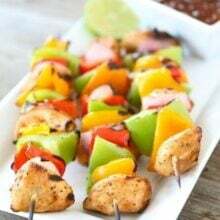 Awesome recipe, my family loved it! Hey Maria, do you rinse the kidney beans first?